For years I have rambled on about the power that keyword rich domain names have when it comes to ranking highly within the search engines. When I say ‘keyword rich’ I mean registering a domain name that has the exact keyword phrase ‘within’ the domain name itself. I have seen FAR too many niches been dominated by ‘fairly’ new domain names that have the keyword within the domain. These top ranking domains often have far fewer backlinks than the other competiting sites. Of course, this is just one factor that Google uses when determining the relevance of a website and MANY people still think that including your main keyword within your domain is not important. I will now show you why it does play a major role. A couple of weeks ago I stumbled across something by accident. From my analytics I saw that a number of people found my blog using the keywords ‘andy black seo’. I typed that phrase into Google and was surprised by the results. You see, the website I was expecting to be at the top was my blog on my Article Writer Pro site. This very blog you are reading now. The reason for this is because my name is plastered ALL over it. The site / blog is also about SEO and internet marketing and it also has page rank and an Alexa ranking of 63,607. The thing is, the blog was not the first site listed in Google. The first site was www.andyblackseo.com. This is the interesting part. 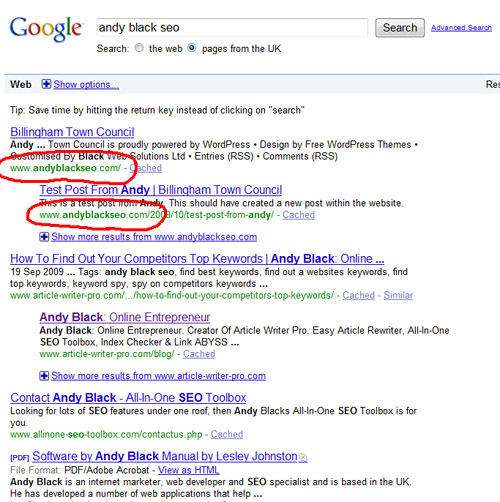 You see, andyblackseo.com is actually my domain. It’s a name I registered recently and so far have not done anything with. Just before Christmas I was setting up a blog for my local council. I installed this ‘council’ blog on www.andblackseo.com temporarily until they had added various posts and pages ready for moving over to their own domain to replace their old website. For some reason, Google had picked up a link to this domain, crawled it and indexed it. This ‘Council’ blog doesn’t have my name plastered throughout it. NONE of the content is related to SEO or related subjects. None of the onpage tags has anything related to myself OR SEO so apart from the ‘domain name’ there is little or no reason why this site should outrank my own blog that has relevace, backlinks, page rank and everything else. The ONLY possible reason why this Council blog is outranking my blog for ‘andy black seo’ is because of the ‘keyword rich’ domain name. The problem we have these days is that the majority of these keyword rich domain names have been taken. I use a feature on my All-In-One SEO Toolbox v2.0 that allows me to convert a large list of keyword phrases to domain names and then checks their availability. Of course you can do this manually or by using other software, but if you dig deep enough you will come across some gems that are well worth buying. If a keyword phrase gets traffic and is a ‘buying’ keyword and available to buy, then snap it up. PARTICULARLY if the domain is available WITHOUT hyphens, with some content and backlinking you stand a good chance of ranking highly for that term, maybe even clinching the no.1 spot. I have included a screenshot showing this new, unrelated blog ranking at no.1 ABOVE my blog. Thanks for sharing Andy. Lets see if its still ranked within 2 months. I doubt it very much! *** Well, it will because by then it should have the new content on the domain which will be about me and my products. The counil site is only hosted on there temporarily. This still shows though that the domain strength has come into play straightaway. Nice article! I couldn’t agree more. I just had one of my sites that only has 6 pages of content but the exact keyword in the domain reach the #1 spot on Google. Whether it stays there I don’t know lol but it’s a PR 0 and 0 backlinks (that will change though). It’s one reason why I like blogs, the more content I add along with backlinks of course then I should (hopefully) enjoy at least a page 1 ranking for a while. Granted, it’s not a highly competitive phrase but I am beating out sites with PR, domain age, and backlinks. Quick question: How do you feel about keyword domains with hyphens if all .com/.net/.org are taken? I suppose I could experiment but don’t want to waste money at this time. This domain (yours) has hyphens and beats out the same keyword domain without hyphens which shows how important backlinks are as well. Do you often go for hyphenated domains if the non-hyphenated variations aren’t available? *** Hi Scott, thanks for your comments and congratulations on getting the top spot. With regards to hyphens, if the .com or .net domains are not available then I would generally go for hyphenated domains. However, I am finding that non hyphenated domains seem to hold more weight with the search engines. The problem we all have is that it is hard to find decent non-hyphenated domains. keyword rich domains work very well. To prove my theory have you ever tried to out SEO a merchancts clickbank product page when they use the product name as the domain name. Its very hard! Andy, I cannot agree more with your discovery about keyword-rich domain names. I am now investing my meager resources towards acquiring keyword-rich domains. Thanks for sharing your discovery. You can rank for your keywords with any domain name, but having keyword rich domains is the ONLY free ride in SEO – I take it each time ! No, this site / blog does not link to andyblackseo.com in any way whatsoever. I found this article useful as it says a lot about the importance of good domains, i have plenty of good domains with me…. The fact that there is no much of keyword domains left available saying about its importance by itself. But I have seen that domain names with hyphens are doing wel – almost the same as without it. I too have also seen this to some extent. For SEO purposes though, I would always opt for the non hyphenated one first if it were available. Sometimes though, depending on the keyword phrase they can look awful and be hard to read. For those wanting to rank in the UK then you can dominate with .co.uk domain. I’ve seen some good examples of this over the last couple of years. Also, i you dig deep enough you WILL find some very good names that are still available to buy. Another good tip is to look for new trends and subjects that crop up. These may be fads but can be open to lots of traffic. It is amazing how well the domain name will rank. I had an example domain that I bought that got page 1 ranking BEFORE I could even add a website to it. This was further proof that the NAME adds HUGE weight. That statement is gold. Yes, most of the obvious keyword rich phrases are taken, but there is a world of untapped keywords. You just have to think outside the box. Look at your niche, dig deep, and you will find gems. Thanks for the article. This is something I have been monopolising on a lot and there are still so many domains that get tons of searches available! I totally agree with your findings. I have a 3 month old, keyword rich domain sitting at #11 currently that I have not done much of anything with. I am glad to hear my suspicions confirmed by yourself. Time for a few backlinks now to see if I can reach top 3. You are right, it does work great but these are very hard to find these days. This post is a big eye opener. I know the benefit of keyword rich domain names, but never knew that it can make that much difference. it appears, keyword rich domain name takes a very high prominence over every other aspect of SEO. Thanks for letting us know about this. It will make me think twice before choosing a generic domain name again. True up to a point Andy. Where the keyphrase has relatively limited competition then yes, a poorly-linked-to correctly-named domain will rank very highly – I mean, how much competition is there for “andy black seo” after all? – as I’ve had completely blank sites ranked #1 just on domain name alone. However, where the competition is more full on then things start to average back to what you’d usually expect based on page title and inbound links as the key determinants. One thing for sure – a keyphrase named domain certainly never hurts your ranking and is always very useful when it comes to getting clicks off of the SERPs. Yes, but the point I was making was by comparing my blog and this new domain with an unrelated blog on it. It was to remove all other factors and just emphasize the strength that exact keyword domains have. I do not think that the keyword in the domain name is prominent over every other aspect of SEO. For those very easy to rank for keywords the chances are decent that a keyword rich domain will rank highly, at least for a short while, and then it succumbs to the Google dance. If your online business model is for ranking in tougher niches with more competition but greater rewards etc then there is no way (or very, very little chance) that – firstly a domain name will be available that is very relevant, and secondly, even if it were it would still take a lot of work to get it ranking high – a lot of work! So therefore it depends on what you want to go for with regards your SEO business model. Want to buy up lots of domains for the very low hanging fruit and work hard this way? Or prefer to go for the higher fruit and not be concerned about the domain name but more concerned about your quality and quantity of backlinks to the website? Either way, if you want to make a good income in the SEO line, you have to slog at it and slog at it some more. Fascinating point. Explains why some sites with no links still rank high. A key-word rich domain should also be great for local business, not just those like yours which have a world-wide audience. I guess that’s where long-tail comes into its own. The term gets moderate monthly global searches, 5400. I check a few minutes ago and it is listed. I don’t think it’s near the top of the listing yet but it sure is a start. Having a keyword rich domain cerainly helps, there’s no question but I’m finding low searched volume keywords, ie 5000 exact and below pretty darn easy to rank with a keyword rich domain. I have one site that dropped to page 2, but it was the keyword .com. I only had 1 small paragraph as I put the site off for later development. I added only 1 500-word article the other day, a few social bookmarks, and now it’s #1 above sites with the same keyword but .org/.net. Interesting. However, I’ll probably be lucky to get 10 uniques per day even at #1. That says something. Now, my focus is keyword rich domains with much higher competition, ie 20,000+ Exact and since the .com/.org./nets aren’t available, I’m willing to hyphenate, add “uk” or some other generic (nothing new here) and pursue a niche ONLY IF my analysis of the first 10 domains proves to show a) low on page backlinks and b) poor on page optimization at least. I honestly think I can outrank even the .coms that are poorly optimized. Lastly, I find it good news when you see the top tlds taken by domainers who simply park their kw rich domain. Andy’s article here is about kw rich domains, having that and good on page SEO is pretty powerful, even against major branded websites. It’ll be interesting to see how my high comp. hyphenated domains do. Who cares if the domain looks ugly!? lol I’m not after type-in traffic! I have to agree with you Andy, keyword rich domains can give you an edge in the SERP’s – even over sites that have the edge in terms of domain age, etc. In my own experience I’ve snagged the No. 2 spot in Google for search term with approx. 853,000 competing pages (broad) and pulling approx. 328 searches per day (exact in season) with a site that’s only 3 months old. My SEO competitors are all established,large shopping sites but their on-page optimization is really poor. So when I set up my site, I paid a lot of attention to my on-page SEO and I’ve been rewarded for it. But I’m not going to rest on my laurels … I will be building backlinks to the site and adding more content. hey Andy good article…just 2 questions though. 1. Lets say I have mymaindomain.com and then I register mykeywordrichdomainaboutwebsites.com and point it to mymaindomain.com. Does google vallue that added domain name? 2. And secondly lets say I redirect mykeywordrichdomainaboutwebsites.com to a page on http://www.mymaindomain.com that deals with websites and do the same for mykeywordrichdomainaboutgraphicdesign.com and point it to a page on http://www.mymaindomain.com that deals with graphic design. Will google value that too? Or does google only take keywordrich domain names into conisderation if they are the orginial host of that website? Do get what I mean? I don’t understand fully what you are saying. Obviously having highly relevant sites pointing links to your site will help your rankings. You really need to host these other sites on unique IP address though so it looks like they ‘belong’ to other people. That will add relevance to those links. I am in the middle of an experiment at the minute. It is looking great at the minute but once it completes I will be writing an ebook showing exactly how I have nailed no.1 positions in Google for my main keywords, and give a blue print on how to replicate that.